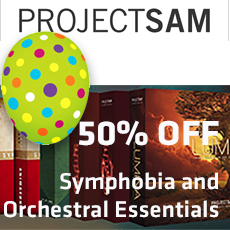 WITH SYMPHOBIA AND SYMPHOBIA 2, PROJECTSAM EXPLORED THE HEAVIER SIDE OF ORCHESTRA TO HELP YOU THRILL DIRECTORS AND AUDIENCES AROUND THE WORLD. Featuring full orchestra, choir, smaller ensembles and a wide range of guest instruments, LUMINA dives into the world of fantasy, mystery and animation, adding depth and delicacy to your musical palette. Based on more recordings than ever before, this third volume in the SYMPHOBIA series is ProjectSAM’s most ambitious release yet. LUMINA’s solo and guest instruments range from legato woodwinds, such as oboe and clarinet, to a beautifully sampled celtic harp, tin whistle and... a full bell tower! The library also pays homage to the playful world of cartoons with dedicated ensembles and phrases for careful tiptoeing and tongue-in-cheek suspense. Of course you will find ProjectSAM´s popular DYSTOPIA section, too, with all-new sound design based on LUMINA’s samples. Multis are a much cherished feature of the SYMPHOBIA series. LUMINA builds on this concept by combining ensembles and instruments into thematic ‘Stories’. Using clever keyboard mapping and controller assignments, Stories give you numerous musical features on one keyboard − all within a single Kontakt track. In this way, LUMINA’s ensembles, solo instruments and textures all take part in a bigger Story. SYMPHOBIA and SYMPHOBIA 2 offer two microphone sets: Close and Stage. These were actually mixdowns of a number of microphone positions, including the Wide microphone setup. In LUMINA, the recorded microphone positions have been split into three fully separate channels named Direct, Ambient and Wide. By default, all 3 mic channels are loaded and activated. The LUMINA interface allows you to individually purge them, reducing the instrument´s RAM footprint by 1/3rd or 2/3rds. The microphone cross-fader allows you to smoothly morph between the Close and Stage ‘preset mixes’ of the three individual mic channels. To illustrate: in Close position, the Direct mic channel is fully open, Ambient is closed and Wide is slightly open. Half-way, all three mic channels are partly open. In Stage position, the Direct mic channel is closed, Ambient is fully open and Wide is significantly open. As stated in the previous chapter, the Wide mic channel can be used on its own, but it was designed to be mixed with the Direct and Ambient channels to add a sense of extra space and width to the sound. I use this instrument as a jump start to orchestration and the instruments as great fills in my music compositions. It is a tool palette with everything needed for epic music . The downside is that it limits in some cases. I really like the quality of the sounds, and the way the sounds change by using the modulation wheel. Using this in combination with my new Akai Advance 61 keyboard is really a pleasure, even though a mapping file has to be created manually.